Blockages in drainage systems can cause all sorts of problems but fortunately there is a very easy way to deal with them: call BP Drains and take advantage of our competitively priced unblocking services in Kent and the rest of the South East. We are a full-service drainage specialist and we pride ourselves on our ability to solve the drainage problems that other companies cannot handle. With this in mind, we recommend you call us first to avoid wasting any more time and let us come and take a look at your problem today. All of our vehicles are fully equipped with all of the relevant equipment to carry out any of the methods as well as CCTV equipment to check the condition of the pipes upon completion. If you have never dealt with us before, you may be wondering how our service works. For full details, you can call us on 01843 293 040 at any time. In the meantime, we have provided a rough guide below to give you some idea of what to expect. The first thing that needs to happen of course is for you to get in touch with us and let us know that you need help. Once you do, we will swing into action. Assuming that you would like a free quotation (most people do), we will come to your home or commercial property and take a look at the drains that are in need of attention. Once we have assessed the state of your drains, we will be able to recommend a particular course of action and furnish you with a detailed quotation for the necessary work. Now it is down to you to make a decision once more. If you are happy with the advice and the quotation that we provide, you can make arrangements for us to visit your home and carry out the work that is required to clear the blockage. 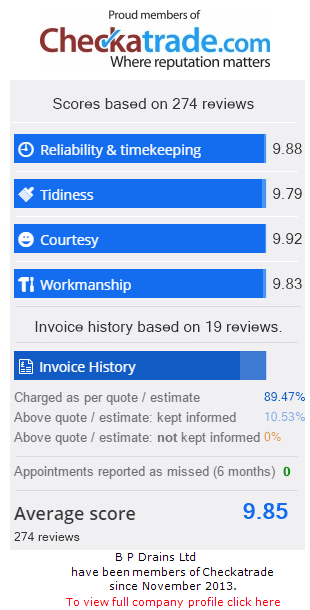 If you are unhappy with any aspect of our quote, please let us know and we will do our best to address your issues. If you are ready to go ahead, we will come to your home with all the equipment and personnel that we need to unblock your drains. Depending on the nature and extent of the blockage, we may use manual rodding, electro-magnetic cleaning equipment, high pressure water jets, or any combination of 2 or more of these options to get the job done. Now that you have some idea of what to expect, why not give us a call and see what we can do for you? As our quotations are completely free of charge and require no commitment on your part to use our services, you have plenty to gain and absolutely nothing to lose. We treat all our customers with the utmost respect and always do our best to minimise any disruption our team may cause when clearing blockages so don’t delay any further, call now and get your blocked drains in Kent dealt with by the professionals.